The abolitionist movement is an emergent and radical approach to nonhuman animal rights. Calling for a complete cessation in nonhuman animal use through the abolishing of property status for nonhuman animals and an adoption of veganism and nonviolence, this approach stands in stark contrast to mainstream approaches such as humane production and welfare reform. 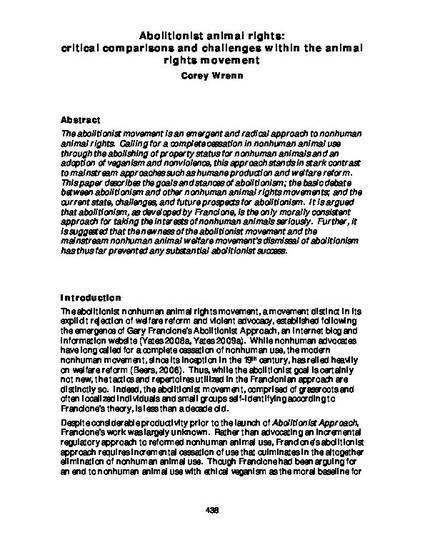 This paper describes the goals and stances of abolitionism; the basic debate between abolitionism and other nonhuman animal rights movements; and the current state, challenges, and future prospects for abolitionism. It is argued that abolitionism, as developed by Francione, is the only morally consistent approach for taking the interests of nonhuman animals seriously. Further, it is suggested that the newness of the abolitionist movement and the mainstream nonhuman animal welfare movement’s dismissal of abolitionism has thus far prevented any substantial abolitionist success. Wrenn, C. (2012). Abolitionist animal rights: critical comparisons and challenges within the animal rights movement. Interface, 4(2), 438-458.